The epic saga continues with Halo® 3, the third chapter in the highly successful and critically acclaimed Halo franchise. Master Chief returns to finish the fight, bringing the epic conflict between the Covenant, the Flood, and the entire human race to a dramatic, pulse-pounding climax. Legendary Edition: $129.99, Standard Edition: $59.99 and Limited Edition: $69.99. Check out the extremely well done Halo 3 Game Guide site. Microsoft has also released a special edition Halo Zune , a Xbox 360 Halo 3 Special Edition console, Xbox 360 Limited Edition Halo 3 Wireless Headset , Xbox 360 Limited Edition Halo 3 Wireless Controller Brute and Xbox 360 Limited Edition Halo 3 Wireless Controller Spartan. 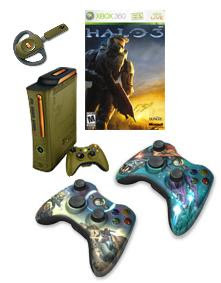 Buy Halo 3, Halo 3 Limited Edition, Halo 3 Legendary Edition, Zune Halo 3 Collector Edition (30 Gb), Xbox 360 Wireless Spartan Controller, Xbox 360 Wireless Halo 3 Headset, HALO 3 The Official Strategy Guide and many more accessories. Funny news about MIT students turn famed Harvard statue into 'Halo' chief via Crave.